3G Watchdog by Richard Gruet. A small, simple and sophisticated app for those of us who are not fortunate enough to own an unlimited data plan on their smartphone or just want to keep track of their smartphone's internet usage. Again, the app is mainly intended for those who want to keep track of their data usage, receive notification when they are starting to use up all their allowance and even block internet usage when the limit is too close. The app has settings for data plan start (day in the month), size and it will clearly notify you with a message and a colorful icon when the data plan is starting to be all used up. Clearly its a very useful app - what would have made it even better is the ability to monitor specific app data usage - but that is reserved for the pro version of the app, which costs money. Score: 5 out of 5. This app does exactly what it sets out to do. 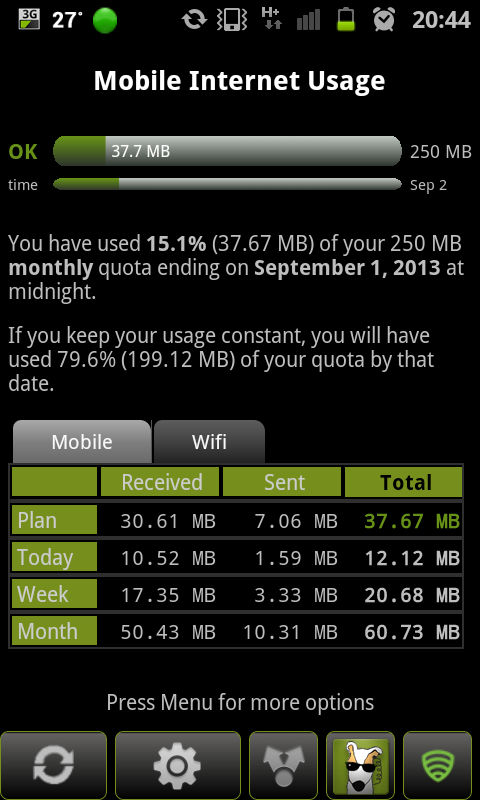 Description: This android app monitors the smartphone's data usage from the data plan over 4G/3G/Edge/GPRS. The user sets up the data plan's size and start time and the Watchdog app constantly monitors data drain. 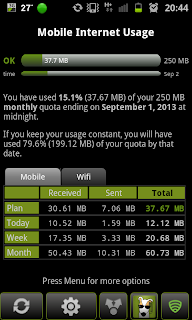 It notifies the user when the data plan reaches its limit by message boxes and color symbols in the notification bar. In addition, there is a very useful optional ability to block data usage when a user supplied limit is reached, usually between 95 and 99 percent. In our experience, the app performs flawlessly, as monitored by other monitoring tools. The only gripe is the data plans themselves. As they are getting cheaper, the time when everyone will have a limitless data plan fast approaches, making this app redundant. Good Points: Clear notification of limit reaching. Ability to set the limits as wanted by the user. Bad Points: There is no way to monitor the data usage of specific apps - this ability is only available on the paid version of the app - 3G Watchdog Pro. Some testers also encountered a bug where the icon in the notification bar disappears (and not when turning their wifi on) but opening the app returns the icon and we think the app still kept track of the data usage even when the icon was not visible. Experience: Since installing this application we encountered no problem on several tested smartphones, it protected us from data usage overflow and the reports it generated where always accurate - we receive the "75 percent" data usage message from the app half a day before the cellular carrier sent us an SMS with the same message. Longevity: This app is here to stay.